1 Evenly spread 1 tablespoon Hellmann's® or Best Foods® Real Mayonnaise on one side bread slices. Heat large nonstick skillet over medium heat. Add bread, mayonnaise-sides down. Evenly top with cheddar cheese. Cover and cook over medium-low heat until bread is golden and cheese is melted, about 3 minutes. 2 Meanwhile combine macaroni and cheese with remaining 1 tablespoon Hellmann's® or Best Foods® Real Mayonnaise. 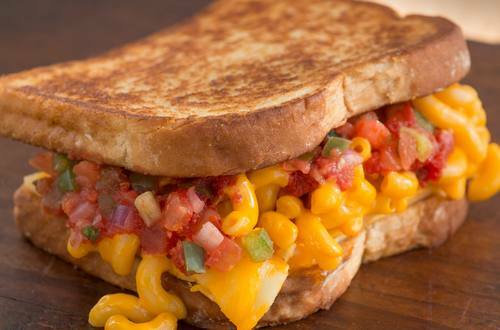 3 Remove toasted bread from skillet; top 1 slice with macaroni and cheese, then salsa and other slice toasted bread.